In the bowl of your stand mixer fitted with paddle attachment, add the butter, sugar and vanilla extract. Mix on low until combined and you have no butter chunks. Add the milk and the cake flour mixture into the mixing bowl and mix on low until you have a smooth cake batter. Scrape the sides of the bowl and mix again if needed so there are no chunks. Separate the cake batter into three bowls, they should weigh about 218 g. each. In one bowl, add ¼ tsp. ColorKitchen Pink Dye, in the second add ½ tsp. ColorKitchen Pink Dye and in the last bowl add 1 tsp. ColorKitchen Pink Dye. Stir to combine all of them completely. Line three 6” cake pans with parchment paper and pour batter into each one and spread evenly. While the cake is baking, in a double boiler add the white chocolate and melt until completely melted. Once the white chocolate is melted spread it all over the ice cream cone and sprinkle it with the white sprinkles. Once it is completely covered in sprinkles, place it on a cookie sheet or plate and put in the freezer. Once the cakes have cooled, remove them from the cake pans and make the cake frosting. In the bowl of your stand mixer add the butter, powdered sugar, vanilla extract and water. Mix on low until all ingredients are combined then speed mixer up to high for 1 minute or until light and fluffy. Scrape bowl if needed and mix again. On a cake stand or spinner, place a small amount of frosting and put the darkest cake later first. Then spread a generous amount of frosting, sprinkle rainbow sprinkles and then top with the second darkest cake layer. 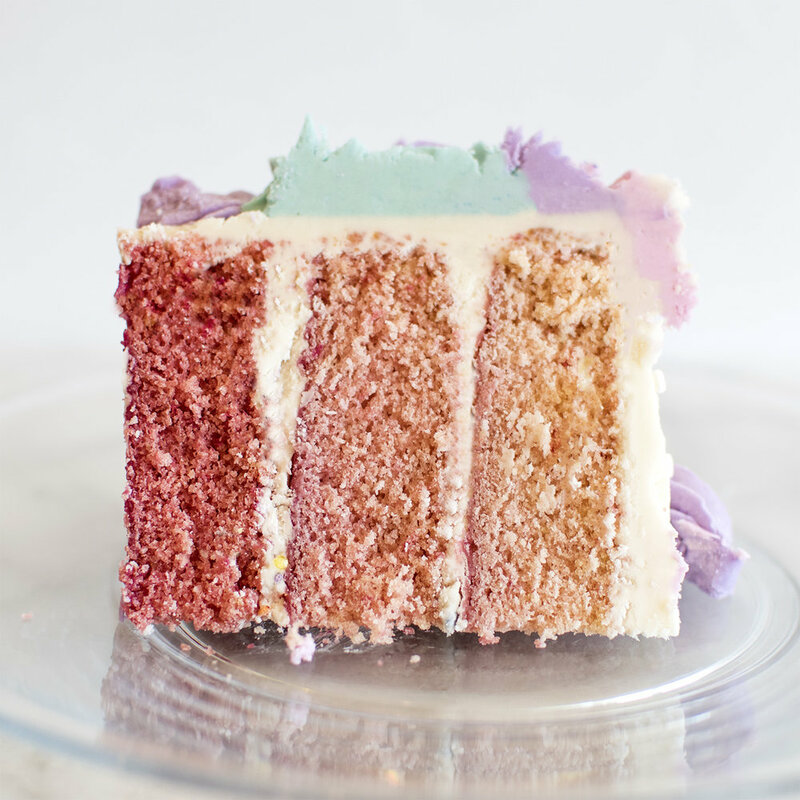 Repeat this process again and top with the lightest pink cake layer. For a full crumb coat tutorial, find one here. Finish frosting the cake smooth. After you have frosted the cake smooth, use the same bowl to make the decorating frosting following the same instructions as the cake frosting that you just made. In a small dish, add ¼ tsp. ColorKitchen Pink Dye and ¼ tsp. ColorKitchen Blue Dye and ¼ tsp. water, mix together to create dark purple dye. Add a very little bit of frosting and stir to combine completely. Put in a piping bag with decorating tip #4. Pipe eyes with eye lashes on the front top part of the cake. You won’t need this dark purple frosting after this. To make the ears, cut rounded triangle shapes out of the graham cracker. Next add a small amount of frosting into a piping bag with decorating tip #8 or similar. Frost the inner part of the ear and cover in white sprinkles. Using the piping bag with the decorating tip #8, pipe frosting onto the bottom of the ears and the bottom of the horn and stick them onto the cake. I put the ears a little more forward than the horn. You can put the remaining frosting from the piping bag with tip #8 back into the mixing bowl with the rest of the white. Get three mixing bowls and in the first bowl add 1/8 tsp. ColorKitchen Green Dye, ¼ tsp. ColorKitchen Blue Dye and ¼ tsp. water and mix to combine into a turquoise food coloring. In the second bowl, add 1/8 tsp. ColorKitchen Blue Dye, 1/8 tsp. ColorKitchen Pink Dye and ¼ tsp. water and mix to combine into lavender food coloring. In the third bowl, add 1/8 tsp. ColorKitchen Pink Dye and ¼ tsp. water to combine into pink food dye. Divide the remaining frosting into the three bowls, adding more into the turquoise than the pink and lavender. Stir to combine the frostings into the three colors. Put the turquoise frosting in a piping bag with decorating tip #846. Put the lavender frosting into a piping bag into a piping bag with decorating tip #96. And put the pink frosting into a piping bag with decorating tip #32. Starting right between the eyes, pipe rosettes with the purple frosting up into the middle of the cake. Fill in with piping dollops with the pink, and then towards the back start the main by piping roses with the turquoise. Fill in with purple, pink and blue however you want – this is the fun part and you can make it look however you want! 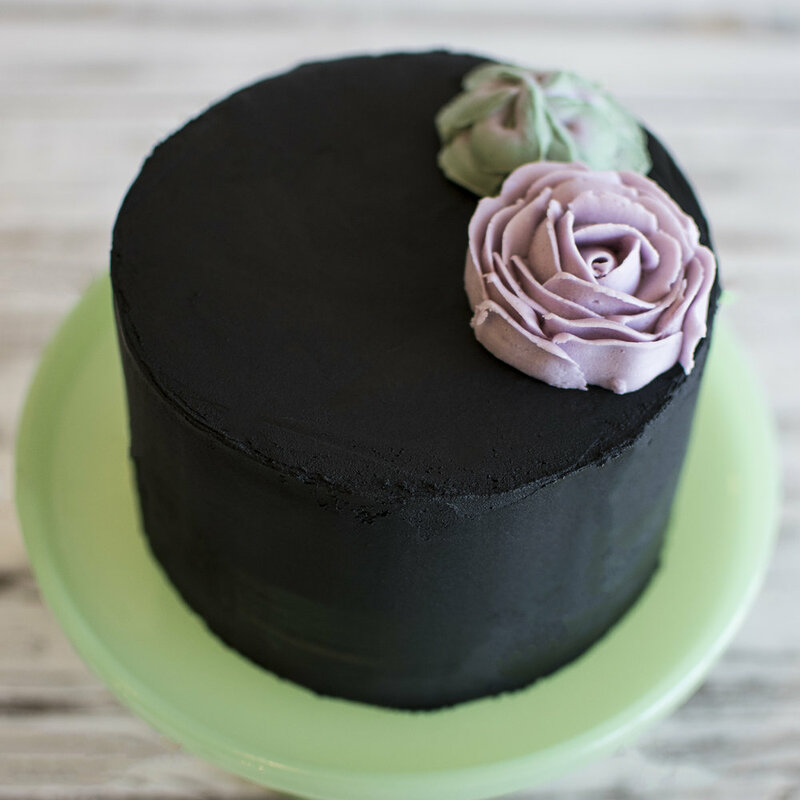 Have you been searching for a way to make a natural black frosting? We've got the ultimate black frosting recipe to make an amazing naturally colorful Black Succulent Cake! Cut parchment paper into 3 inch squares and have ready for later. You’ll want as many squares as you’ll have succulents. Line three 6” cake pans with parchment paper or grease and flour. In the bowl of your stand mixer fitted with whisk attachment, whisk egg whites at medium/high speed until stiff peaks form. Transfer to a separate bowl and set aside. In the bowl of your stand mixer fitted with paddle attachment (no need to wash), cream the butter, sugar and vanilla extract until smooth. In a separate bowl whisk together the cake flour, baking powder and sea salt. Add in the cake flour mixture to the butter mixture alternately with milk, beginning and ending with cake flour. Gently fold the egg whites into cake batter until smooth. Measure batter evenly into each cake pan, about 225 g. each. Allow cakes to cool or place in the freezer while you make the succulents. In a clean bowl of your stand mixer fitted with paddle attachment, make the lavender frosting first. Add the butter, powdered sugar, blue dye, pink dye and water and mix on low until combined. Then speed mixer up to high for 1 minute or until light and fluffy. Put the frosting in a piping bag with decorating tip #126. Using a decorating nail, place a small dollop of frosting on the nail. Then place a square of parchment paper on the nail so it sticks. With your piping bag turn it so the thick side of the tip is on the bottom and the thinner side is on the top. Pipe a circle, creating a cone. Then pipe another one right on top of it. Next, holding your piping bag the same way, pipe an upside down “U” on top of the cone. Then pipe 2 more to create a circle around the cone. You have now created the first layer of your rose. Continue to pipe upside down “U” shapes around the center until you have a larger succulent looking rose. Pull the parchment paper off the nail and place on a baking sheet and place in the freezer. I piped about 4 of these so I could pick the ones I liked best for the cake. Pipe them until you have ones you like, you can even put the frosting back into the bag if you don’t like how it looks and you’re practicing. Just make sure to save some of the lavender frosting, at least a third of it. Next, make the dark green frosting. In a clean bowl of your stand mixer fitted with paddle attachment, add the butter, powdered sugar, blue dye, green dye, activated charcoal and water. Mix on low until combined, then speed mixer up to high for 1 minute or until light and fluffy. In a piping bag with a coupler and decorating tip #104 put half the dark green frosting in on one side and the rest of the lavender frosting on the other side, it doesn’t have to be perfect. Using the decorating nail again, pipe a dollop of frosting on it and place a square of parchment paper. With the piping bag facing straight down and the large side in the center, pipe a spiral. Next, going around the spiral, pipe upside down “U”s again creating petals. Do a couple layers to create however tall you want the succulent to be. Pull the parchment paper off the nail and place the baking sheet in the freezer. Save some of the two toned frosting and change out the tip for decorating tip #32, you’ll use this to fill in the top of the cake later. Next, make the green frosting. In a clean bowl of your stand mixer fitted with paddle attachment, add the butter, powdered sugar, green dye, blue dye. Mix on low until combined, then speed mixer up to high for 1 minute or until light and fluffy. Put about half of the frosting in a piping bag with a coupler and do not put a decorating tip in just yet. On a square of parchment paper, pipe a large dollop of frosting. However tall you make this mound will be how tall this plant is. Now add the decorating tip #75. Starting at the top, pipe a line down to the bottom. Then directly across from that line do the same thing so half of the dome has a line down to the bottom. Next, pipe a line down to the bottom from half way between those two lines on each side, so you have four lines going down to the bottom. This will help keep your plant symmetrical. Next fill in the holes with lines going from the top to the bottom. The bottom doesn’t have to be perfect because you can trim this later. I just used a knife to trim off the edges so it was smooth. Place the parchment paper square on the baking sheet with the rest of the plants in the freezer. Remove the decorating tip and replace it with decorating tip #199. You will use this later to fill in the top of the cake. With the other half of the green frosting, add the blue dye and a pinch of activated charcoal. Stir to combine completely so you have a dark turquoise frosting. Put in a piping bag with a coupler but do not put a tip in just yet. On a square of parchment paper, pipe a large dollop of frosting exactly like you did with the green. Now put the decorating tip #8 in the coupler. Just pipe spikes coming out of the middle of the dollop, going all the way around. Pipe another set on top, placing them in between each of the bottom ones and continue up until the circle is full of spikes. Place this on the baking sheet with the rest of the plants and keep the baking sheet in the freezer until you are ready to assemble the cake. By this time your cake should be cooled and ready to assemble. So it’s time to start the black frosting. In the bowl of your stand mixer fitted with paddle attachment, add the butter, powdered sugar, activated charcoal, vanilla extract and almond flavor. Mix on low until all ingredients are combined then speed mixer up to high for 1 minute or until light and fluffy. I found the charcoal dried out the buttercream just a little so add a little water if you would like it a little more loose. On a cake stand, plate or spinner stack, frost and crumb coat your cake. You can find a tutorial here. Next frost your cake smooth. And now you are ready to start assembling the succulents! Remove your succulents from the freezer. In order to stick them to the cake, just pull them off the parchment paper and place a dollop of frosting on the bottom and stick to the cake. Once you have stuck all the larger succulents on the cake and filled it how you like, just fill in the empty spaces with dollops of the green and green/lavender frosting. Baker’s Note: You can make the succulents 24 hours in advance, just store them in the freezer! Also, to make this cake gluten free just substitute the all natural cake flour for an organic gluten free flour blend, our favorite is Namaste Organic Perfect Flour Blend. * COLORKITCHEN, INC. ASSUMES NO LEGAL RESPONSIBILITY FOR USE OR RELIANCE UPON INGREDIENT RECOMMENDATIONS. Add in the eggs and mix on low until combined. Scrape down the side of the bowl and mix again until combined. In a separate bowl, mix together the cake flour and sea salt. Add in the cake flour mixture and milk, alternating each and beginning and ending with the cake flour. Mix on low until combined. Scrape sides of bowl and mix again on low until combined. Grease a 10 x 10 inch silicone bundt pan well with butter. The one we used to make this recipe can be found here. And, pour the cake batter into the bundt pan. If you are not using a silicone bundt pan, bake for 1 hour and then test with a wooden pick inserted into center to see if it needs more baking time. Go up in increments of 10 minute based on if the cake is gooey or not. Bake for 1 hour 45 minutes or until a wooden pick inserted in center comes out clean. Once cake is cooled, remove it from the bundt pan, carefully. In a clean mixing bowl fitted with paddle attachment, add the powdered sugar, milk, pink dye and strawberry flavor. Mix on low until combined into a smooth frosting. 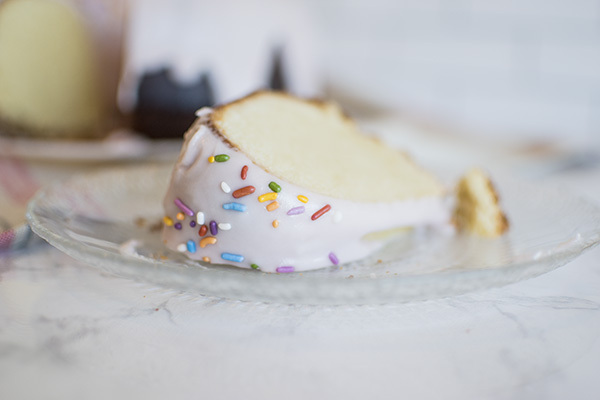 Place cake on a cake stand, and drizzle the frosting over the top of the cake so it runs down both sides. Sprinkle the top of the frosting with rainbow sprinkles. In the bowl of your stand mixer fitted with paddle attachment, add the butter, sugar, brown sugar and vanilla extract. Mix on low until all ingredients are combined. In a separate bowl add the flour, cinnamon, ginger, cloves, salt and baking soda. Whisk to combine. Separate the frosting into six bowls. In the first bowl, add g. 30 g. This will be the white for the eyes. In the remaining five bowls, add 185 g. of frosting. To make purple, add 5 g. ColorKitchen Pink Dye and 3 g. ColorKitchen Blue Dye. To make orange, add 5 g. ColorKitchen Orange Dye (or 3 g. Pink Dye and 8 g. ColorKitchen Yellow Dye). To make red, add 3 g. ColorKitchen Pink Dye and 3 g. ColorKitchen Yellow Dye. For yellow, add 5 g. ColorKitchen Yellow Dye. To make the brown, add 5 g. Dutch cocoa. Stir them all to combine completely. Put the white in a piping bag with decorating tip #8. Put the chocolate in a piping bag with a coupler so you can change the tip. First, put tip #12. For the feathers you can use tip #104 or #150. If you only have one or two of these tips just change them out as you go. I started with purple first and just made a zig zag pattern along the upper part of the cookie. I did two rows of each color. Then switch to red, then orange and then yellow. For the red and orange make sure to use a coupler in the piping bags so you can switch out the tips for feet and neck. Once the feathers are piped, pipe the body with the chocolate, in a giant U-shape. Pipe eyes with the white. Change out the tip in the chocolate to tip #2 and pipe the eyes. Change out the tip in the orange to tip #56 and pipe the feet. Then pipe a round nose. Then pipe the gobbler part of the neck using red with tip #150. Baker’s Note: To make this gluten free, just substitute the organic flour for 145 g. organic gluten free flour blend. 1. Preheat oven to 375 degrees. Make crust: Butter a 9-by-3-inch springform pan. In a food processor, pulse graham crackers until fine crumbs form; add melted butter, sugar, and salt, and pulse to combine. Press crumb mixture firmly into bottom using the back of a measuring cup. Bake until set, 10-12 minutes; let cool. Reduce oven to 300 degrees. 2. Set a kettle of water to boil. Make filling: Using a food processor, blend cream cheese and sugar till smooth. Add lemon zest and juice, and salt. Add the sticky inner seeds of the vanilla bean. (Stick vanilla bean pod in your sugar jar for vanilla scented sugar.) Add in eggs, one at a time, scraping down side of bowl after each addition. Add in sour cream. 3. Wrap entire underside of pan in foil. Use multiple sheets if you need. Make sure the foil is very secure. Pour in filling; place in a roasting pan. Place the roasting pan in the oven. Gently pour in boiling water to come halfway up side of springform. Bake until just set in center, about 1 ¾ hours. Remove pan from water. 4. Whisk the sour cream and sugar together. Then put about ⅓ cup of the mix into a separate bowl and add ColorKitchen color, after mixing with ¼ -½ tsp glycerin or water to dissolve. 5. Cover the top of the warm cheesecake with the white sour cream mix. Spread smooth. Put the colored sour cream into a pastry bag or a small ziplock bag with the corner cut off. Pipe the mixture into small lines across the entire top of the cheesecake. Then, using a butter knife, begin dragging the knife through the lines in the opposite direction. 6. Place the cheesecake, without water, back into the oven for 10 minutes to set the topping. Let the cheesecake cool completely. Run a paring knife around the edge of the cheesecake to loosen from pan. Refrigerate till completely cold. Once chilled, carefully remove the edge of the springform pan. Use a spatula to smooth sides of cheesecake. Keep cheesecake covered with plastic wrap in the fridge for 5 days.